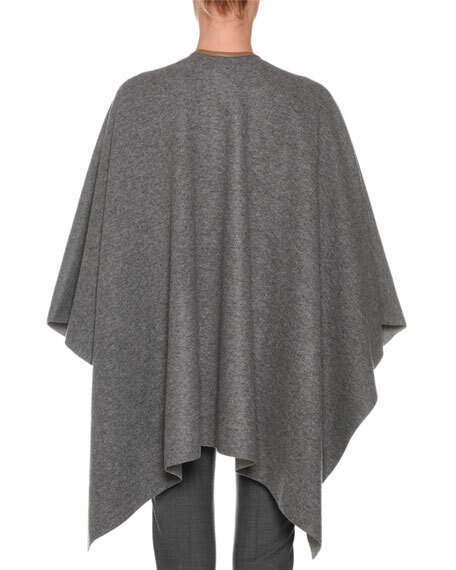 Agnona cashmere shawl with natural fox fur (Finland) pockets. 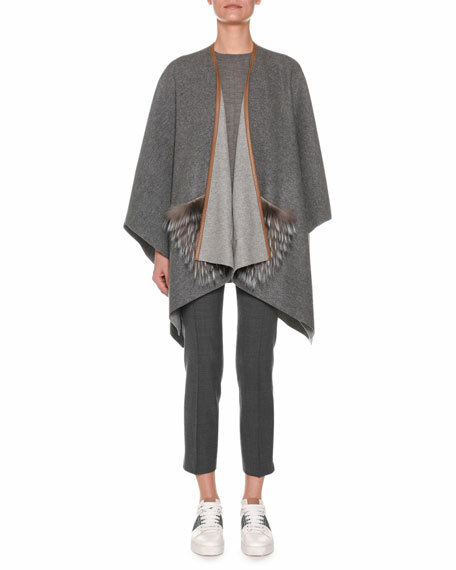 Draped, open front; leather trim. Faliero Sarti L'Acessorio "Lustrina" shawl with sequin border. Approx. 65"L x 57"W (165 x 145cm). May be styled multiple ways. Faliero Sarti L'Acessorio "Lustrina" shawl with sequin border. Approx. 65"L x 57"W (165 x 145cm). May be styled multiple ways. Finished edges. Modal/silk. Made in Italy. Model's measurements: Height 5'10"/177cm, bust 33"/84cm, waist 25.6"/65.2cm, hips 35.8"/91cm, dress size US 2-4/FR 34-36. Loro Piana reversible scarf with contrast leather borders. Ample size allows many ways to drape, tie, or knot. Signature grommet detail at corner. Drapes over shoulders. Cashmere/nylon; goatskin trim. Made in Italy. Model's measurements: Height 5'10"/177cm, bust 33"/84cm, waist 25.6"/65.2cm, hips 35.8"/91cm, dress size US 2-4/FR 34-36. 12GG, 2-ply shawl with metallic stripes. Draped, open front. Three-quarter sleeves. Oversized fit. Asymmetric, fringed hem. Cashmere/polyester/metallic fibers. Dry clean. 12GG, 2-ply shawl with metallic stripes. Draped, open front. Three-quarter sleeves. Oversized fit. Asymmetric, fringed hem. Cashmere/polyester/metallic fibers. Dry clean. Imported. Model's measurements: Height 5'10"/177cm, bust 33"/84cm, waist 25.6"/65.2cm, hips 35.8"/91cm, dress size US 2-4/FR 34-36.